A few weeks ago Pet Lamb attended a less than fabulous market. The high winds which hit the North of England and Scotland saw a four day market turn into a two day rush! Thanks to the blustery weather I was left with an abundance of Hershey’s Kisses which normally adorn the top of our double chocolate cupcakes. Rather than resign myself to Kris munching his way through three huge bags, I decided to use them in some relaxing Christmas Eve baking. I’ve seen these adorable cookies on many American blogs but always thought Hersheys Kisses were a little too pricey to use in such large numbers. Up until recently I only ever saw them in the American food section of fancy food halls sporting a massively inflated price tag. Thankfully the candy company appear to have started trading in the UK, supplying most major supermarkets for a pocket friendly price. Now if only Junior Mints were to do the same! Preheat oven to 190C and place rack in the center of the oven. In the bowl of your electric mixer (or with a hand mixer), beat the butter until creamy and smooth. Add the peanut butter and sugars and beat until light and fluffy. Add the egg and vanilla extract and beat to combine. Beat in the milk. In a separate bowl whisk together the flour, baking soda, and salt. Add to the peanut butter mixture and beat until incorporated. Cover and chill the batter for about an hour, or until firm enough to roll into balls. Roll the batter into 1 inch round balls. Place the granulated white sugar in a shallow bowl and roll each ball in the sugar. Place on the prepared baking sheet, spacing about 2 inches apart. Bake the cookies for about 8 – 10 minutes, or until the cookies are lightly browned. Immediately upon removing the cookies from the oven, place a unwrapped Chocolate Kiss into the center of each cookie, pressing down gently until the cookie just starts to crack. Cool completely on a wire rack. Mm, I'll be testing these in the new year, YUM! They look so pretty! 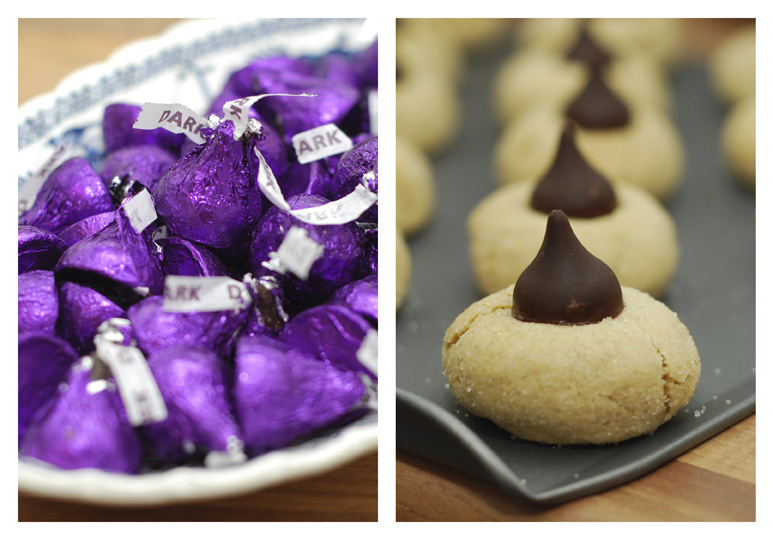 I'm not keen on hershey's kisses, but those look like great peanut butter biscuits just on their own.